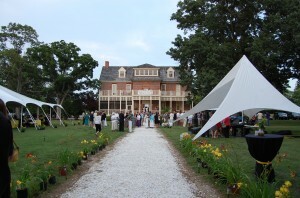 Every June for the past 15 years, one of the Eastern Shore of Virginia’s primary arts groups, Art’s Enter, has hosted a huge benefit party, “Benefit By The Bay“, to raise money for the expenses of running the organization and maintaining the historic Palace Threatre in Cape Charles. This year’s Benefit was, as usual, a smashing success. 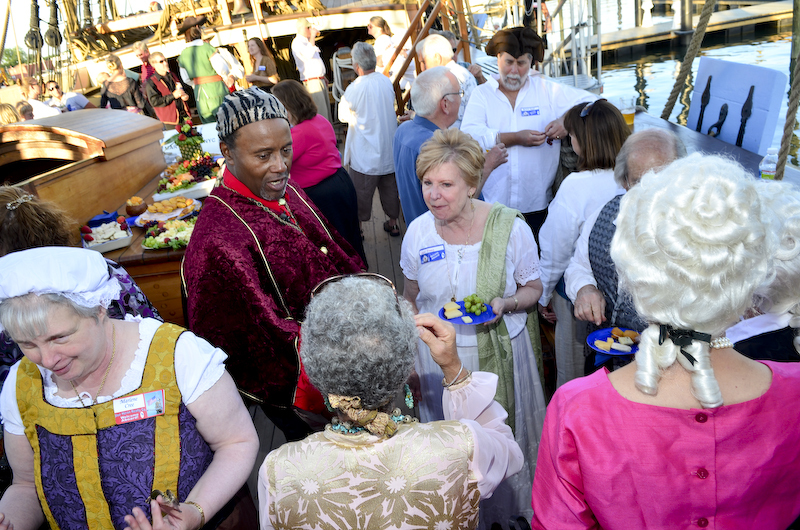 The brainchild of Clelia Sheppard, one of Art’s Enter’s original founders, Benefit By The Bay attracts people from all over who come to enjoy a wonderful evening of delicious food and wines followed by dancing till midnight under the stars. And a Silent Auction. Irresistable ! 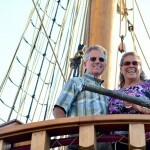 Although other commitments have prevented us from attending every single year, my husband and I have been to about 9 or 10 Benefits and they are always lots of fun. This year was no exception. 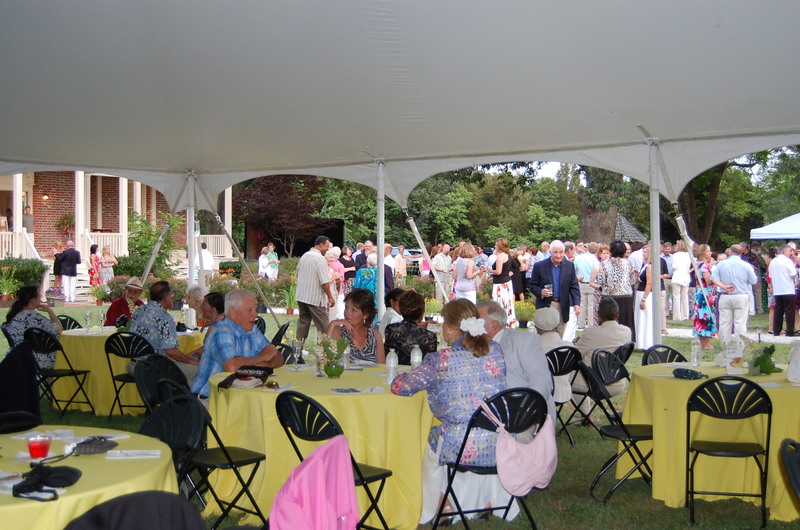 In fact, we enjoyed it immensely, even more so because it was held this year at Tower Hill House, a gorgeous historic waterfront estate home which is listed for sale by Blue Heron Realty Co. ( see post of June 15th ). In case anyone ever questioned it, the Benefit proved Tower Hill house is a superb home for entertaining. 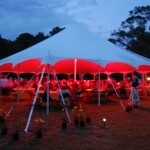 A huge white tent on the back lawn, a small tent for the band, a bar and appetizer tent near the back porch, various food serving stations down near the waterfront, over 300 guests plus catering staff and still plenty of room for more — now that’s a Chesapeake Bay area home I call truly perfect for entertaining ! 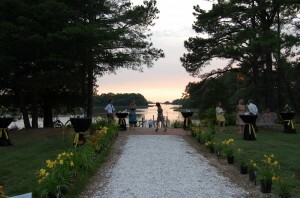 Guests were greeted near the front steps with a glass of champagne and tickets for drinks at the bar, then it was onward through the entry foyer and out to the long, velvety back lawn, beautifully dressed for the occasion with masses of colorful Stelladora and Coreopsis lilies outlining the long, elegant walkway from the house to the dock. 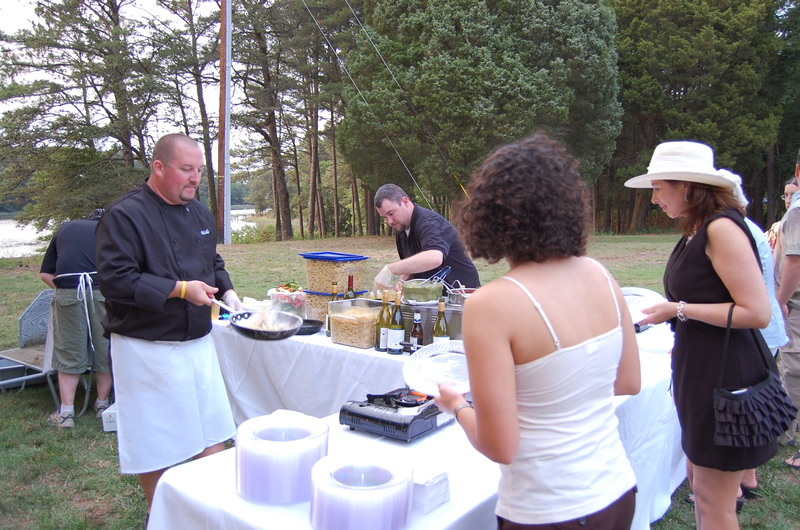 We were running somewhat late, no surprise there, and arrived at the appetizer tent just as the caterer was beginning to clear away but did manage to spear some of the last of the mini crabcakes and a bit of curried chicken salad– both were delicious. Eldest daughter, who didn’t run late, informed us somewhat smugly that had we been a little less late we could have tried the tuna tartre and the shrimp cocktail as well as some heavenly stuffed puff pastries. Ah well…. 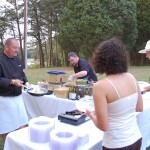 Catering this year was by Johnny Mo, well known here on the Eastern Shore as the “Singing Chef” and proprietor of Mallard’s Restaurant located on the Wharf in Onancock, VA. ( See our spring post of Johnny at Holly Grove Vineyard. ) 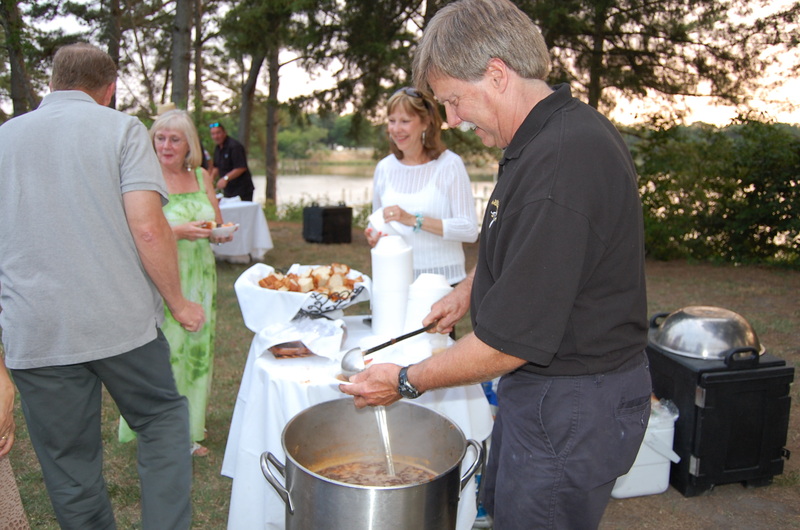 A talented chef with an eye for presentation and doing things with an interesting twist, Johnny was surely a great choice for this event. 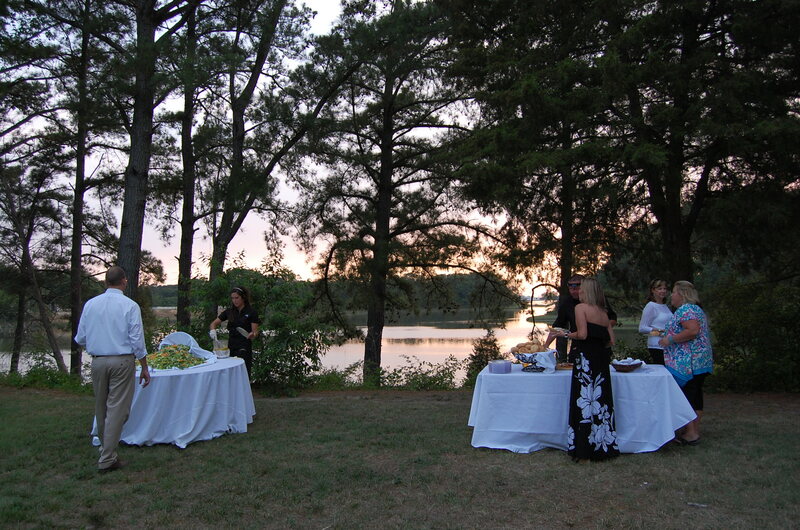 After finding our table under the tent and stowing purses, etc., we wondered out to the waterfront area where food stations were set up and little lines beginning to form, smiling people having a great time on a balmy spring evening, waving to friends, lots of happy chatter. We started out at the Salad Station, chopped romaine and other salad greens dressed lightly with a tropical vinaigrette and tossed with tidbits of Mandarin oranges and mango. I took our salad plates back to the table while my husband stood in line at the Eastern Shore Seafood Boil Station where a savory mixture of shrimp, mussels, corn and tiny new potatoes in an aromatic seafood broth was being ladled into bowls, served with slices of crusty French bread for dipping into the delicious broth, all so very yummy. I confess– I immediately plotted to later go for a second helping ! 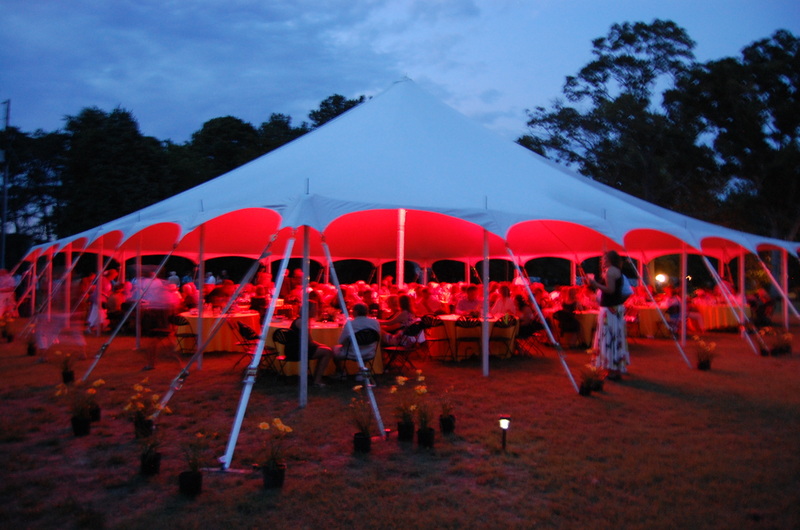 Back at the tent, others at our table were happily sampling the roasted pork tenderloin with red pepper-raspberry glaze served on mini rolls, which I decided to try as well….. but only after another helping of the Seafood Boil. 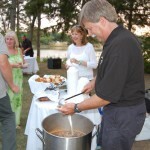 But the really popular item of the evening was the Pasta Station where you could order penne pasta dressed before your eyes with your choice of pesto, alfredo or marinara sauce, served with or without slices of chicken breast which had been grilled to perfection. I went for the alfredo, my husband for the marinara — we both agreed the sauces were luscious. As it happened, we were in line just ahead of William Neil, the musical director for the Palace Theatre, and chatted a bit about his upcoming gig with Lynn Summerall and the Hotel Paradise Rooftop Garden Orchestra on July 10th at the Jewish Mother restaurant in Virginia Beach. A bit of a co-incidence since we had attended the band’s May 8th performance there and really had enjoyed it immensely. 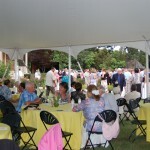 Back under the tent, dessert trays were being passed, beautiful fruit kabobs of watermelon, honeydew and pineapple chunks, deep red juicy strawberries dipped in chocolate or my personal favorite, a delicate chocolate mousse made with Godiva chocolate. Who could ask for anything better ? Meanwhile, inside the house the spacious formal living room was becoming a beehive of activity, the Silent Auction would soon be going strong, bidders circling around the room, increasing their offers, all bids to be in by 9;30 pm, winners to be announced the following day. 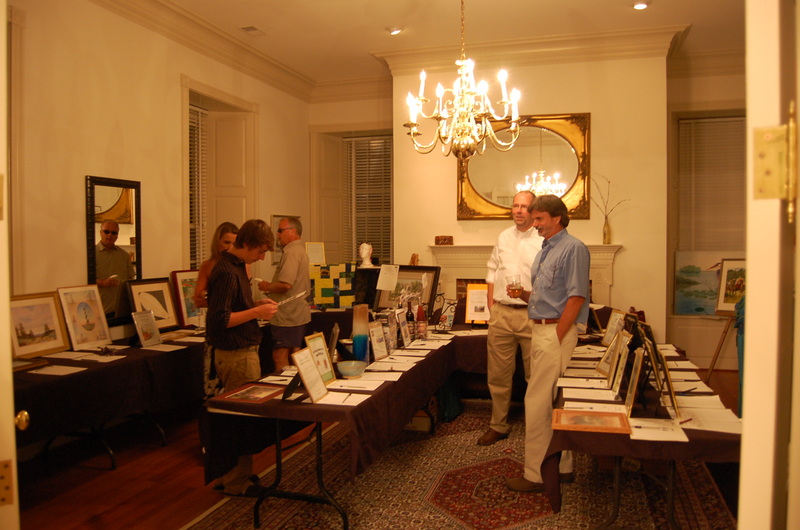 Each year generous local businesses and artists contribute a wide variety of items to be sold at the auction as part of the fundraising. 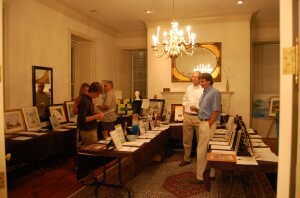 This year over 100 entities contributed a myriad of items, a huge variety of goods, services and artwork ranging from a day at the spa to a beautiful original watercolor by Clelia Sheppard, to the worthy cause of supporting Art’s Enter’s efforts to enrich lives on the Eastern Shore through the arts. Because of an early appointment the next day, we left shortly after Art’s Enter’s School of Dance performed a selection from Hansel & Gretel entitled “Fire Dance”. The band was just getting going again, the stars were shining brightly, a balmy summer’s evening, perfect for dancing cheek to cheek. 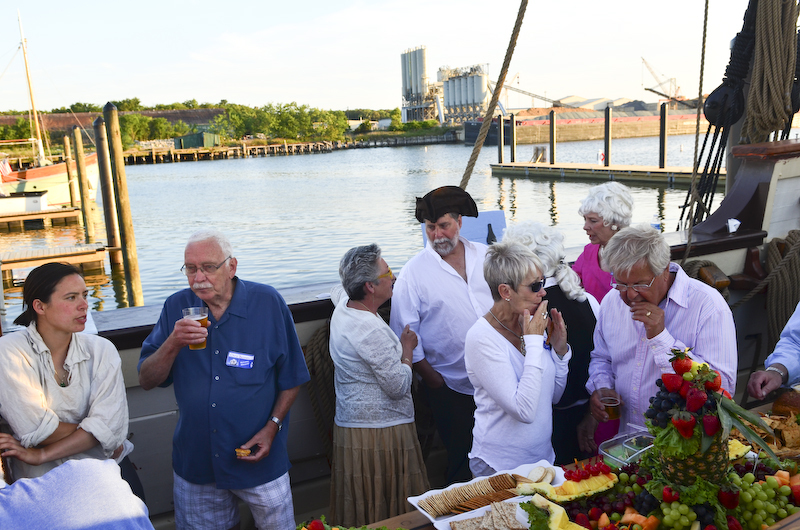 Chalk up another great Benefit By The Bay ! 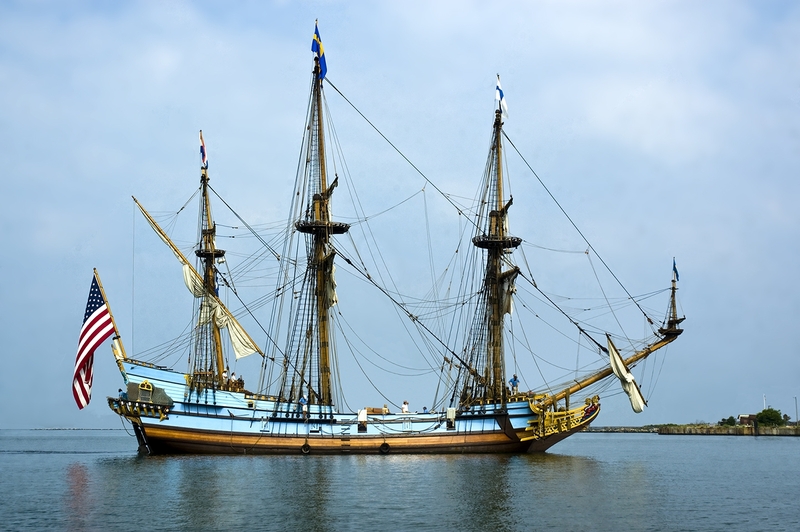 The Kalmar Nyckel is a reproduction of a 17th century Dutch tall ship with three very tall masts and eight miles of rigging which make her a most impressive sight as she cuts through the water. 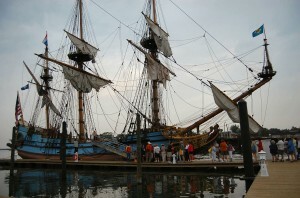 Kalmar Nyckel’s total sail area is over 7000 sq.ft. — to get an idea of what really means, consider that the average US house is about 2200 sq.ft so she sports three houses worth of sails ! Wow ! 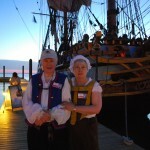 At any rate, as an element of her visit to the Eastern Shore of Virginia and her 6 day stay in Cape Charles’ new marina, sponsored in part by Blue Heron Realty Co. , my husband and I as well as several other family members took a day sail from the Cape Charles harbour well out into the Chesapeake Bay, a real experience indeed and memorialized in this video. 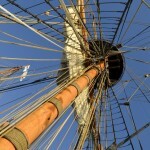 Passengers had an opportunity to see the crew climbing high up into the rigging and to experience for themselves the crew numbers and physical strength and effort it takes to operate such a ship as they participated in hoisting the sails, pulling to the rhythm of the seaman’s chantey, “Bully In The Alley” . 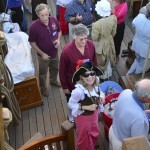 An impromptu “Man Overboard” drill was ordered by Captain Lauren Morgens when a crew member’s big straw hat was blown overboard. So a “Hat Overboard” rescue was attempted with the aid of a little motorized Zodiak but it was clear to everyone that in the 1600’s when someone went overboard, rescue was pretty much hopeless because a ship under sail would be so far away from the critical area before a lifeboat could be manned and rowed to the spot. 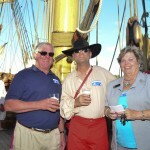 Our crew was great and everyone had time to answer questions. 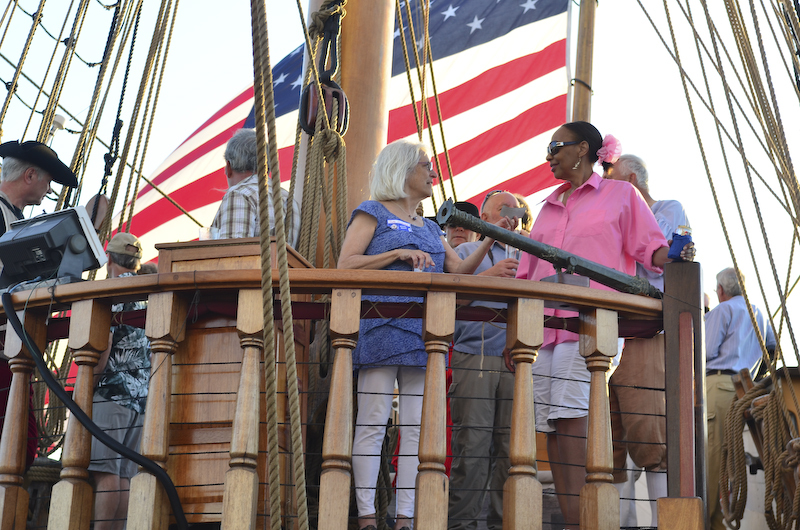 I think I peppered Helmswoman Ellen Carter with a million queries about daily life aboard such a ship for the crew of about 20, mostly volunteers, with a paid crew of 4. 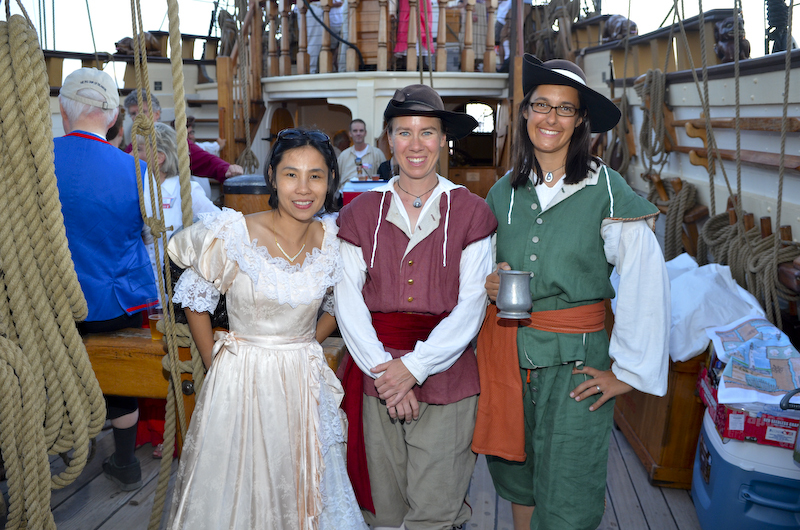 From cast-off to tie-up, everyone had a great time, learned a lot about trans-ocean travel 17th century style and stored some good memories. 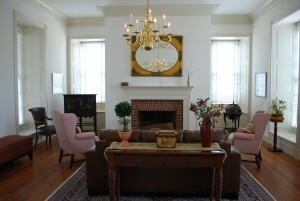 As it has since 1746, this elegant 5500 sq. ft. historic Virginia waterfront home, now for sale, one of the finest on the Eastern Shore of Virginia since it was built, stands sentinel over King’s Creek, a broad saltwater inlet from the Chesapeake Bay just a few minutes east of Cape Charles, VA. Remembering the roads of those early days, or rather lack of them, it’s easy to see why the location of Tower Hill was so desirable. 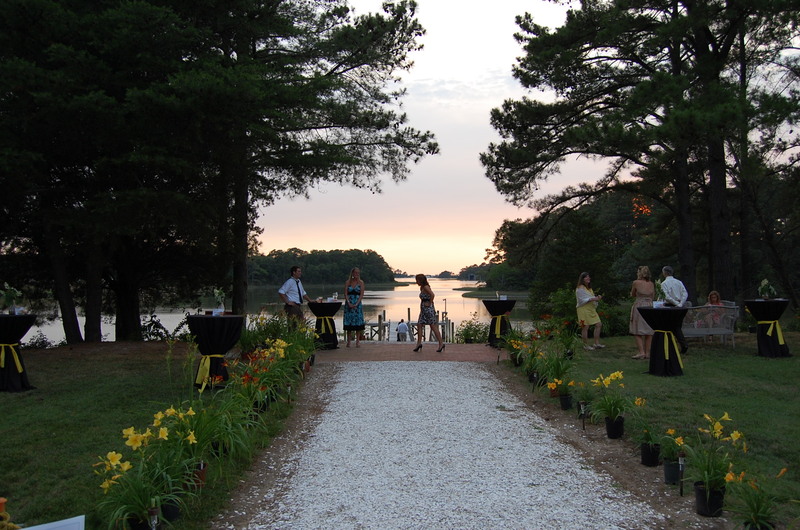 When you stand on the rolling rear lawn and look down the inlet, you can actually see the Chesapeake Bay in the not-too-far distance. 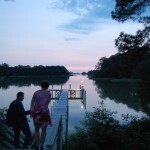 Since travel by boat was one of the most common means of travel on the Eastern Shore in the 1700’s, the fact that Tower Hill was on a deep channelled inlet with such a close connection to the Bay, ( which functioned as the interstate highway of that day ) meant that its owners had exceptional access to shipping and receiving goods and hosting important visitors. This would have given them many financial advantages and increased social status. 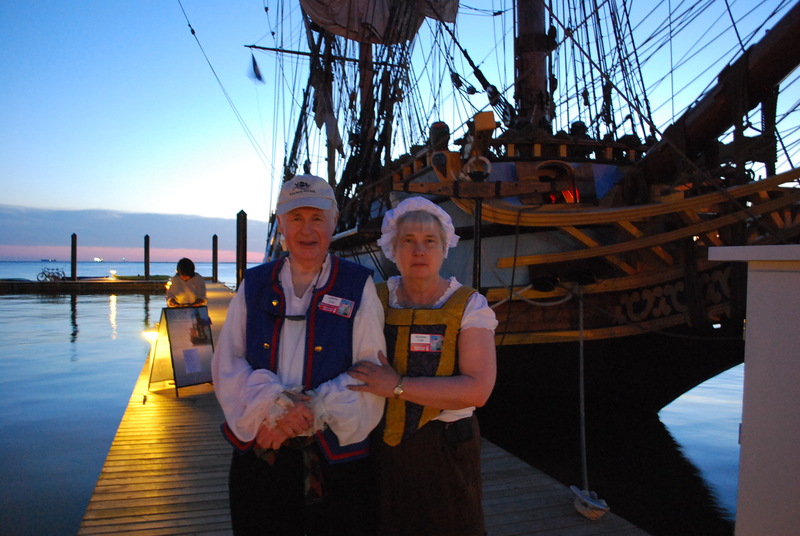 Being in the Shore’s very southern tip was advantageous then as well because of easy access to the Atlantic Ocean and to commerce with the nearby Yorktown and Williamsburg, which were already important towns. 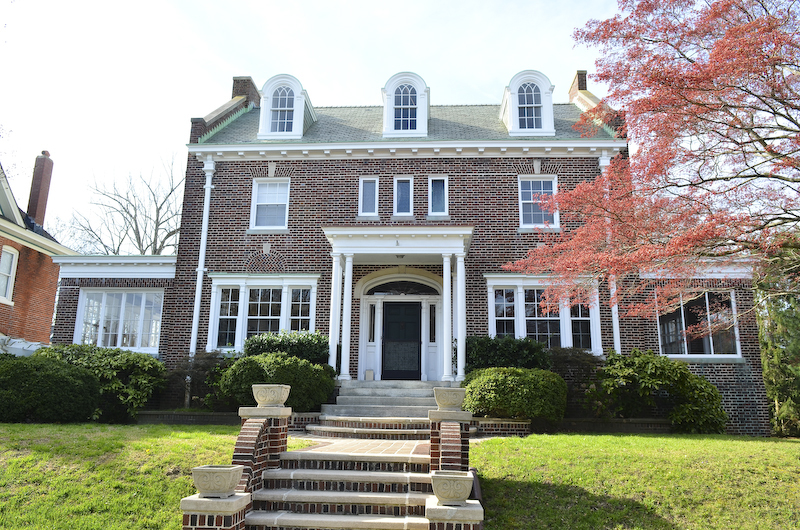 Then, as now, it was location, location, location and this site’s superior physical attributes as well as its natural beauty explain why the original owner invested what would have then been a small fortune into the construction of this majestic brick manor home. 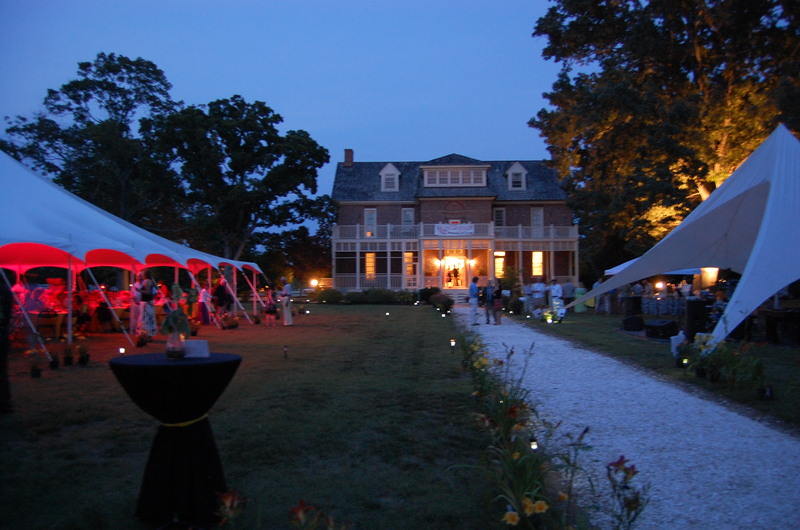 And Tower Hill still has a most superior location, being less than ten minutes to the Chesapeake Bay Bridge and Tunnel connecting the Eastern Shore to Virginia Beach and Norfolk and only about five minutes to the beaches, golf and other special amenities in the historic town of Cape Charles. 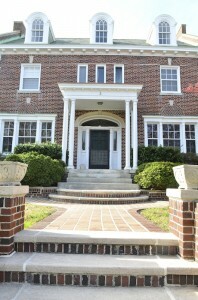 Built of brick in a blue tip Flemish bond pattern, the Tower Hill House architecturally is classic Georgian style with its attention to symmetry, balance and proportion. 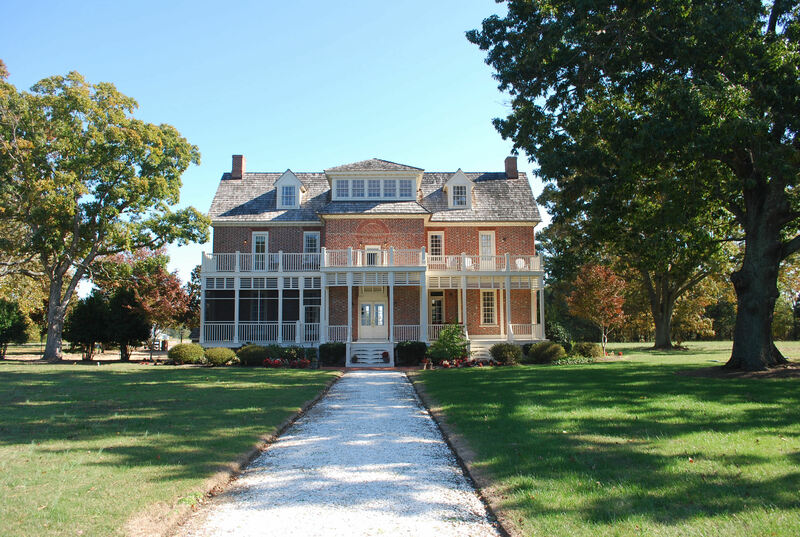 Other period details include a chimney at either end of the home, side-gabled roof, paneled front door with pilasters, crown and an overhead transom. 6-pane small dormer windows are inset on the top floor. Fully restored in 2001, Tower Hill House retains all the charm of a truly historic home but the 2001 restoration has now outfitted this fine home with all of today’s modern conveniences as well, pretty much having your cake and eating it too. 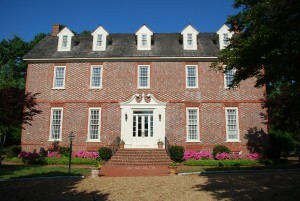 The approach to Tower Hill House is most impressive– professionally landscaped, with a brown pebble circular driveway edged withcobblestones and lined with mature crepe myrtles and magnolia trees. Walkways of Tuscan red pavers and foundation plantings bridge the space between the driveway and the 6 curved brick steps with gentle risers and black wrought iron hand rails. A deep landing brings you to the double leaf front glass panel door with glass surrounds and an elaborate crown supported by detailed pilasters opening into the formal foyer with the kitchen and dining area accessed on the left through double French doors. 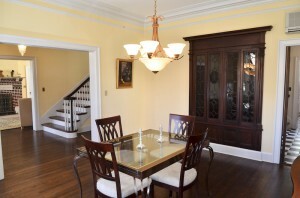 The formal living room is accessed on the right also through double French doors. It is the central foyer which first introduces one to the real beauty of this historic Eastern Shore home. 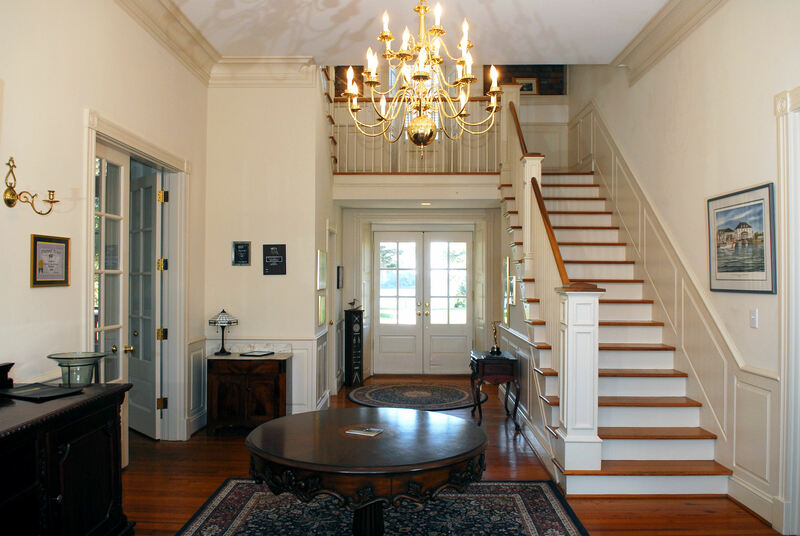 Quite large, with high ceilings, raised panel wainscoting and elaborate moldings throughout, the foyer provides the first views of the water through double French doors leading to full length rear porches overlooking the inlet, the dock and on out to the Chesapeake Bay. 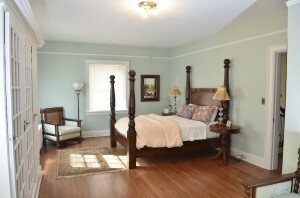 It is immediately apparent that this home was restored with loving care, using fine materials and talented craftsmen. 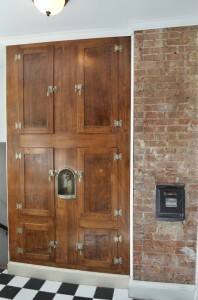 The workmanship is outstanding. The gracious formal living room is especially notable with deep set, floor to ceiling windows which flood this lovely room with natural light, and, since it is one room deep, windows are on both the east and west side of the room. 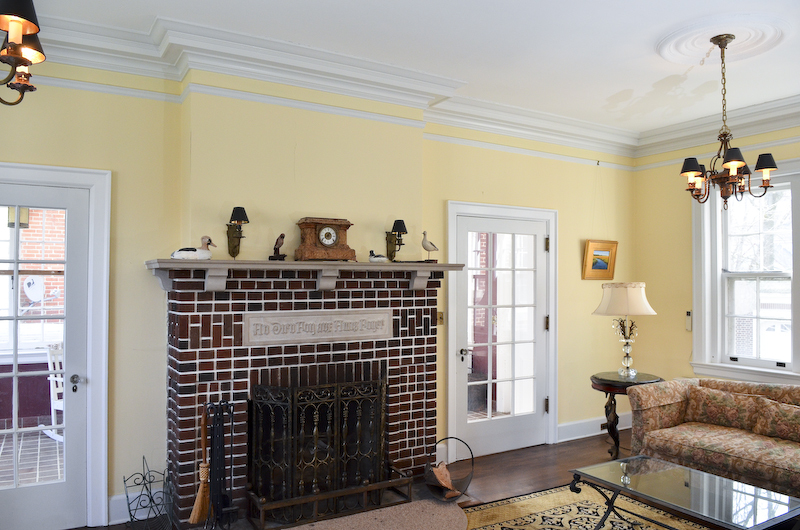 Five piece crown moldings with dentil woodwork, fireplace with elaborate surround, 8 panel wooden doors with brass hardware add to the charm. This is a very restful room with lovely views out to the water, and, as the home has an east-west orientation, is a great place to enjoy the spectacular sunsets over the water. Smooth, green lawn rolls gently down to the water, dotted with mature shade trees including a huge oak which must be several hundred years old. Colorful landscaping all around this home is certainly part of its overall ambience . Upstairs, the 2 master bedrooms each have French doors leading a private balcony overlooking the water and the impressive dock, which will accommodate several boats. With a total of 5 bedrooms and 6 and a half baths, clearly there is plenty of room for personal guests or to restore the B&B usage. 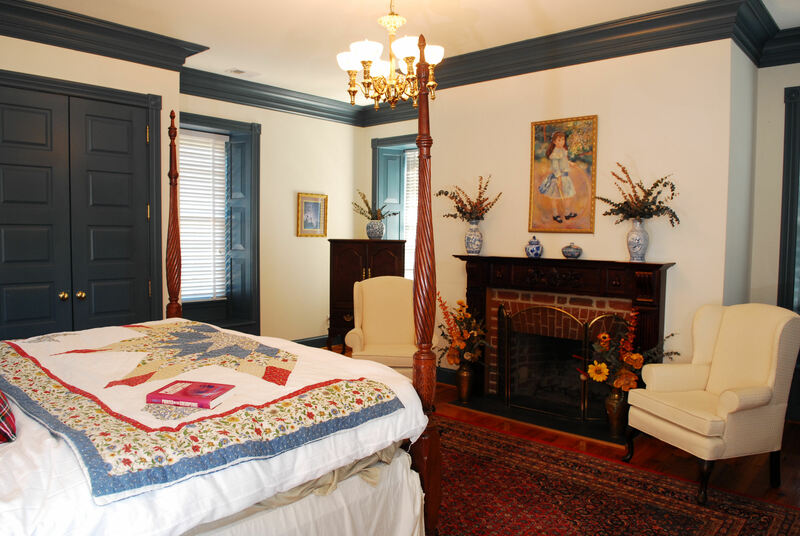 Each bedroom features a fireplace with carved mantel and a slate or marble hearth, 4 piece crown moldings and deep set windows with window seats. Luxurious bathrooms abound, each with enclosed custom tile shower and claw footed tub. 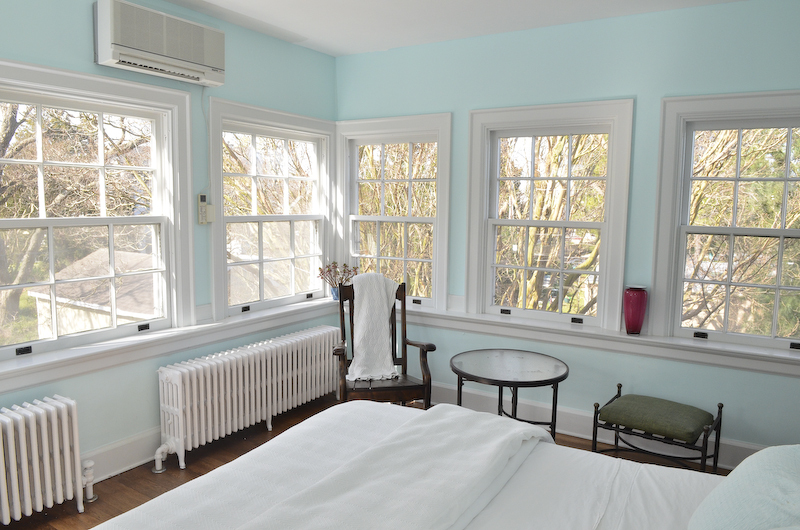 On the 3rd floor there is a special window package which brings in lots of light including restful natural light in the stairwell. 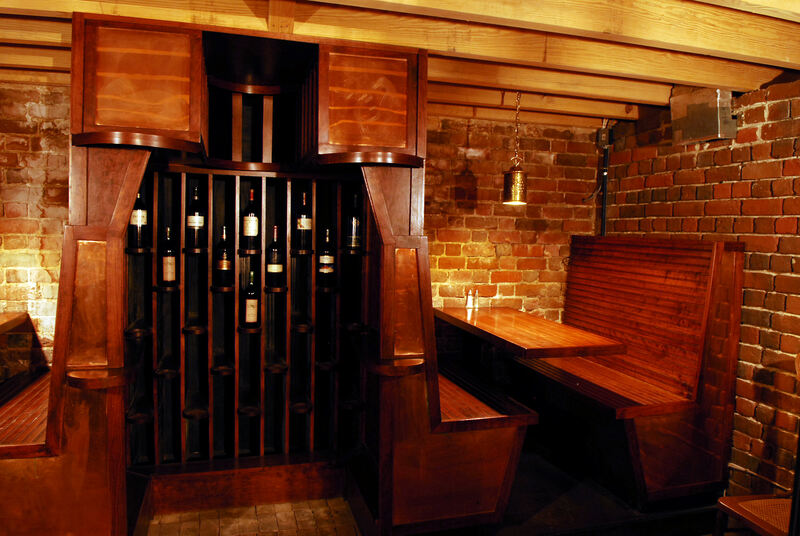 Downstairs in the finished full- house- length brick walled basement, the large wine cellar has custom wrought iron gates, an extensive wine rack and large wine cooler. Lots of ornate wrought iron throughout the entire area. 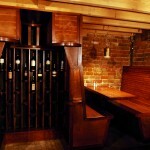 Another portion of the basement features a large “walk-in” wood burning fireplace and a bar area with a wood burning stove. 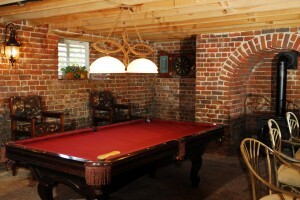 Plenty of room for pool table, card tables and other toys including a large screen TV — it’s a great “play” room, for sure. Includes open beams throughout the basement, floors of brick or tile and a full bath located just off the wine celler area. Like the rest of the house, the basement is totally wired for music throughout. Ready for some time at the beach ? It’s only about five minutes from Tower Hill house to the glistening sand beach in Cape Charles. 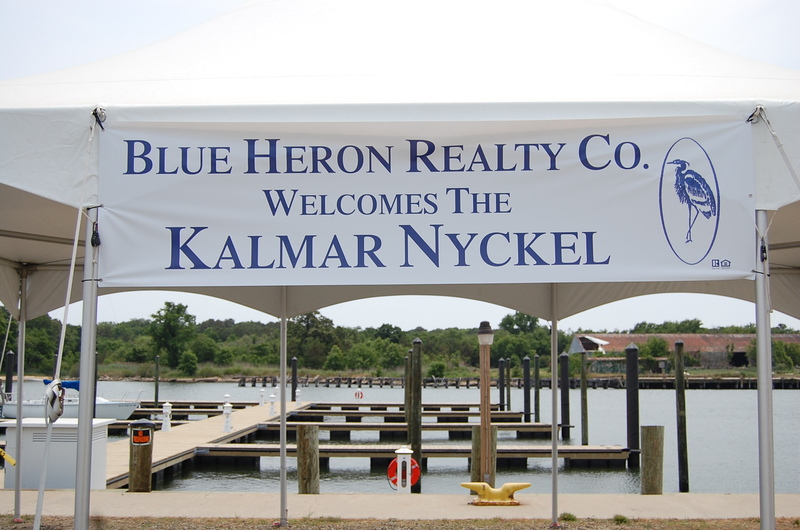 For golfers, the new signature Arnold Palmer and Jack Nicklaus courses designed around shoreline of the Chesapeake Bay and Old Plantation Creek provide challenging golf in a simply beautiful setting. In fact, the # 3 hole on the Palmer course was voted the “Number # 1 Golf Hole in Virginia” so it’s clearly pretty special. Plus 19th hole relaxation at the Coach House Tavern is always a treat– it overlooks the driving range and practice putting green so you can watch your friends trying to improve their handicaps a point or two, always fun. All the other amenities of Cape Charles, from fine and casual dining to shops to theatre add so much to the lifestyle and pleasure of owning the Tower Hill house. 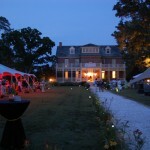 And without a doubt, the Tower Hill house is one of the finest historic waterfront homes on the entire Eastern Shore. 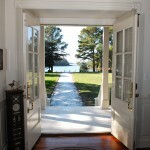 It offers history and elegance in a gracious waterfront setting, close to so many special amenities. 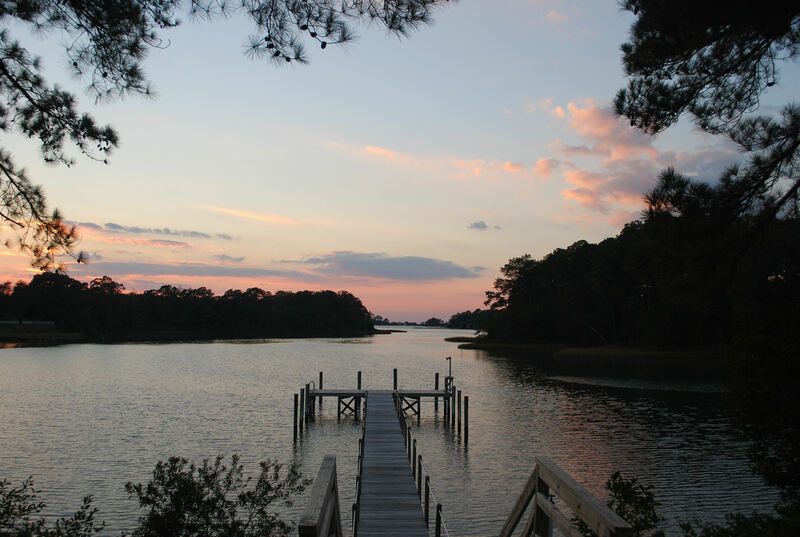 For an appointment to see it for yourself, call Blue Heron Realty Co., 757-678-5200. 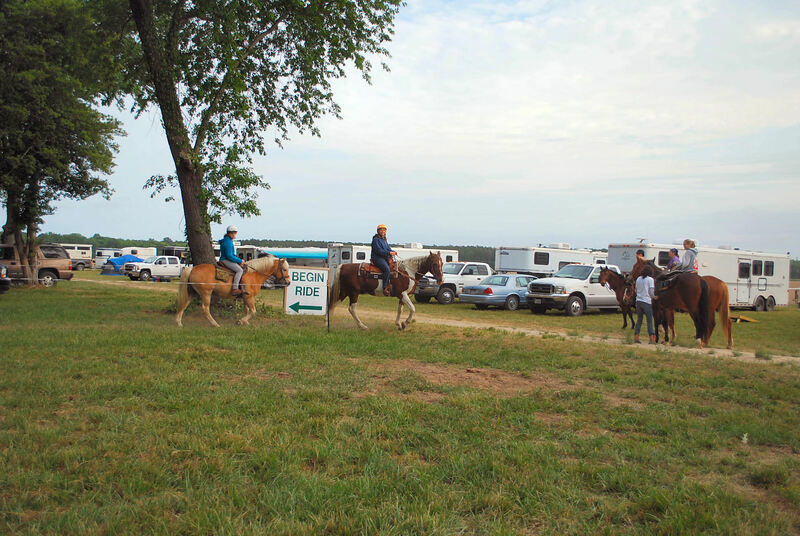 A few weeks ago a friend and I dropped in on the spring Eastern Shore Trail ride to speak to a few of the folks who had come out for that Ride. 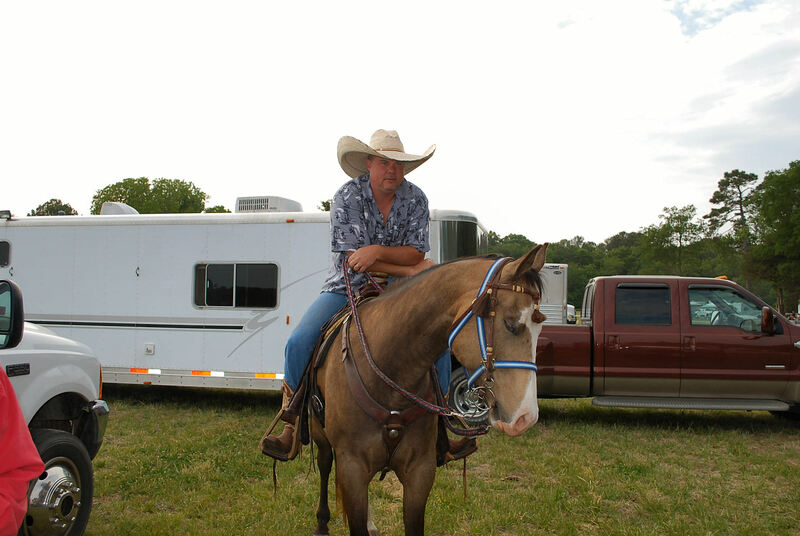 I was interested in learning where the riders were coming from and in taking a peek into a couple of the live-in horse trailers ( when I say “live-in” I don’t mean just for the horses, I mean for the owners !) 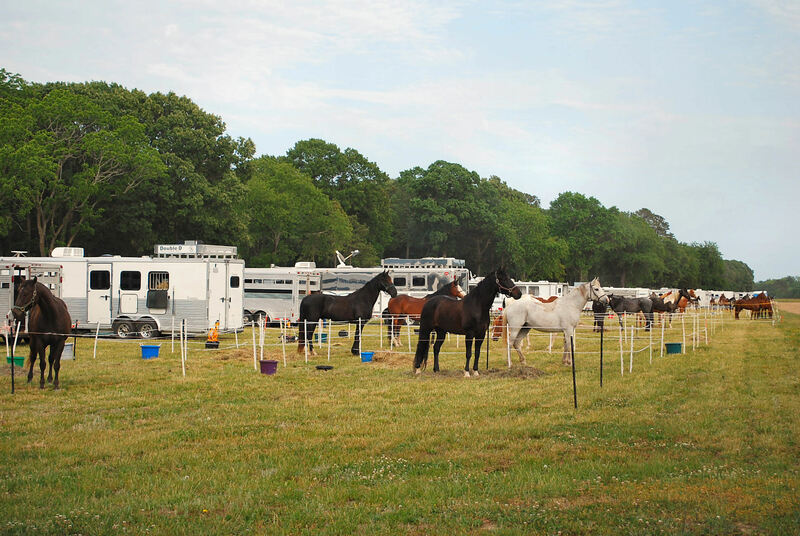 At any rate, when we arrived most of area was already set up, trailers parked, horses happily munching away on what I’m assuming were tasty chunks of hay, etc. 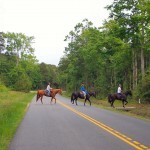 I’m not sure just how many people or horses were there that afternoon but the official Eastern Shore Trail Ride web page (www.easternshoretrailride.com) indicates that the Rides are limited as to the number of participants, with only 250 previously registered horses and riders allowed. 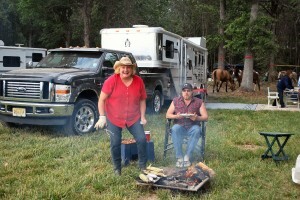 One of our first stops was at the handsome trailer of some folks from up near Farmville, VA, about 3 hours away, who were just settling down with several friends to prepare what smelled like a scrumptious dinner. 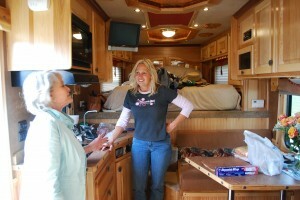 They were kind enough to invite us to take a peek inside– surprisingly roomy, with a bunk over the hitch area, cute kitchen with a little stove and microwave, built-in table with a window, a bathroom that included a shower with skylight plus a satellite dish on the roof, nearly all the comforts of home. 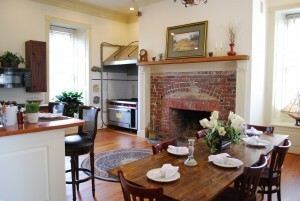 And the horse’s digs were great too ! 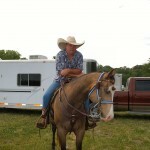 After our peek into their “home away from home” they were kind enough to then introduce us to a nearby friend, a nice fellow in a 10 gallon Stetson, hailing from from the mid- part of Virginia, sitting on a robust 16 hand horse ( showing my age again, but he really reminded me of Hoss from Ponderosa ) who had a unique wedding last November … he and his bride, a veterinarian who has more than 20 horses, were actually married in the saddle ! Definitely wishing Happy Trails to them ! Walking on down the line, we met 2 couples who had driven all the way from New Jersey to participate in this Ride, their first time to come to the Shore. 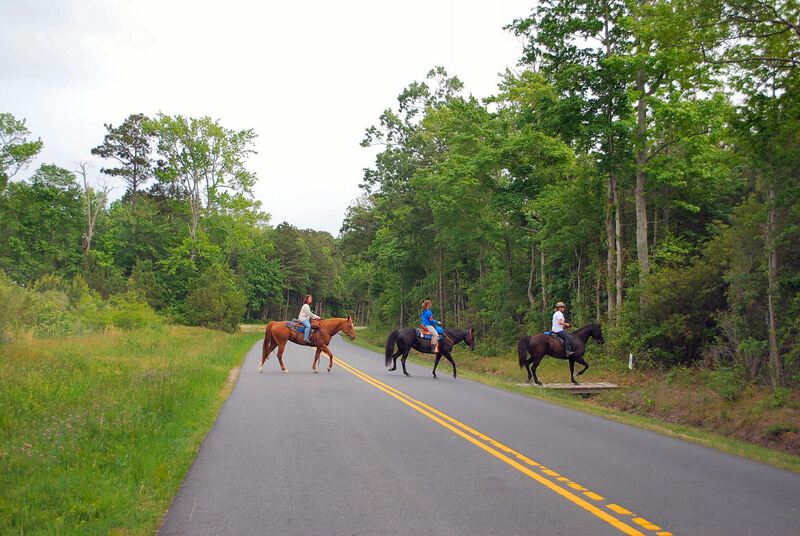 I was curious and when I inquired as to why they would drive so far to ride their horses, they indicated that they were really interested in seeing Virginia’s Eastern Shore and that the prospect of being able to ride their horses along a private beach was most intriguing to them. ( Lots of info on the trails, etc. 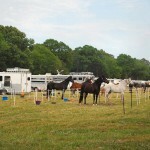 plus an application to attend can be found on the official Eastern Shore Trail Ride website. ) 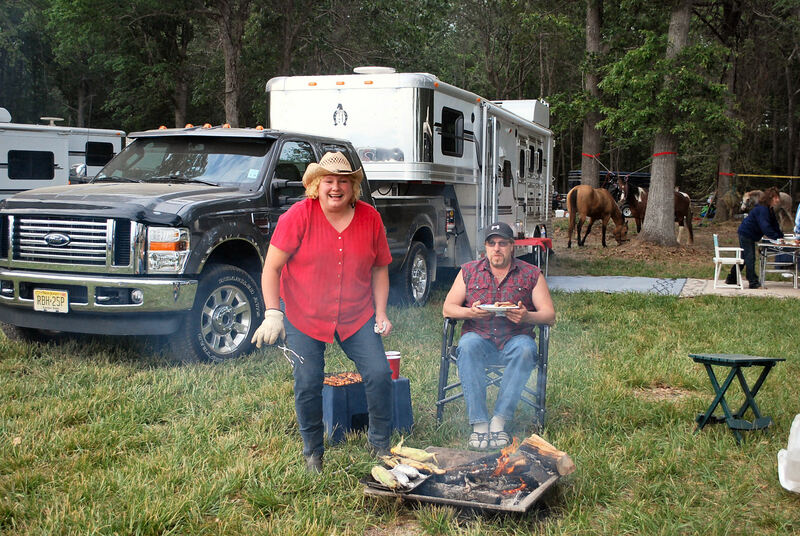 They too were just beginning to cook an aromatic meal over the fire, corn on the cob and baked potatoes wrapped in foil already cooking, with shrimp and steaks primed to pop on the grill, a great trail dinner for sure. 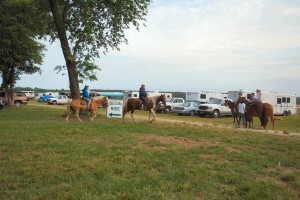 Walking back towards the car, we passed a sort of “saddlery on wheels”, with all kinds of items that might be needed by the riders on the spur of the moment, doing a brisk business, everybody laughing and talking in anticipation of the big ride the following morning. It all seemed like a lot of fun to me and clearly the folks who were participating were looking forward to some happy times on the trail. And all for a good cause as the proceeds benefit Northampton County Fire and Rescue Company 16. 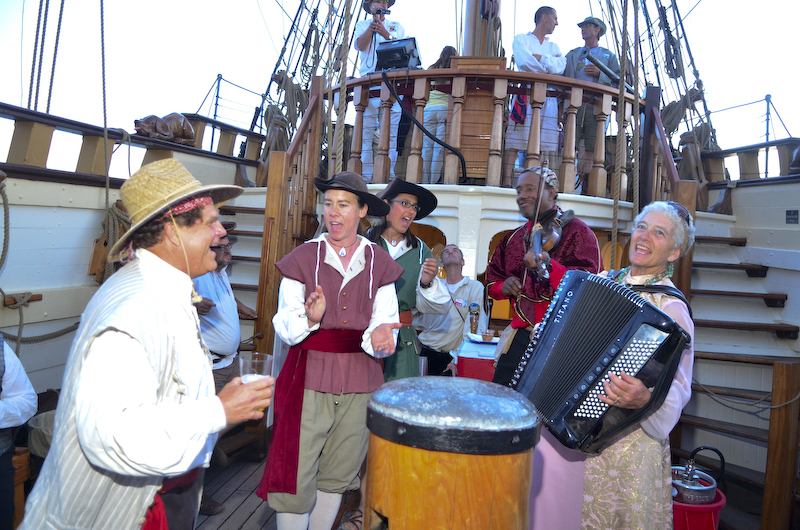 Kalmar Nyckel– Part 2, The Day Sail. 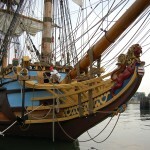 She Sails The Ocean Blue, This Saucy Ship Of Beauty. 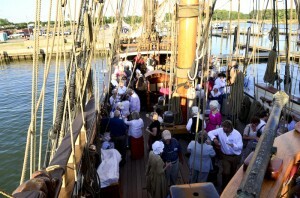 As part of her 5 day stay in the Cape Charles harbor, the tall ship Kalmar Nyckel offered several opportunites for the public to board the ship for deck tours as well as four different day sail trips for up to 49 passengers per trip out into the Chesapeake Bay. We had selected the Sunday 10:30 am time slot for our sail but Sunday dawned dark andovercast, skies threatening a serious downpour at any time. The Eastern Shore definitely needs some rain so I didn’t feel but so bad but hoped it would clear up in time for the trip which included my husband, daughter, son-in-law and youngest granddaughter as well as myself. But when we arrived at the dock the crew informed everyone in line on the pier that the Captain was still monitoring the weather to decide if it would be a go or no-go. 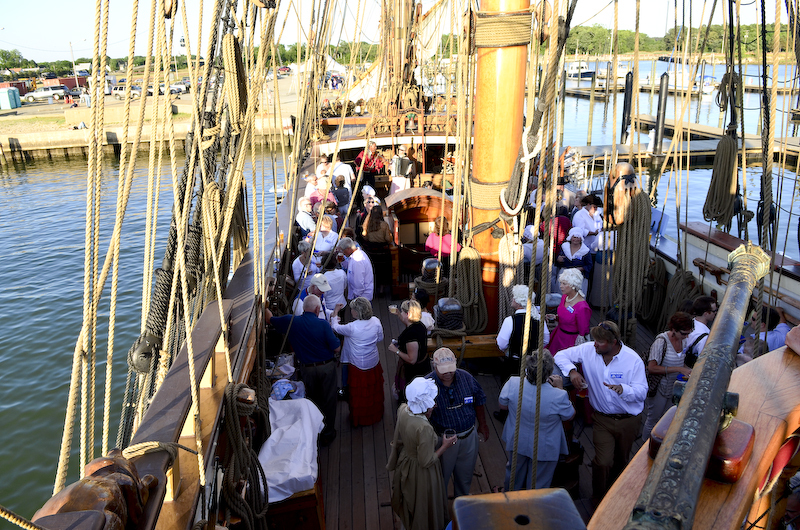 Fortunately it began to clear and the crew allowed us to board, everyone excited to sail on a ship which is a faithful reproduction of an early 1600’s Dutch pinnace. 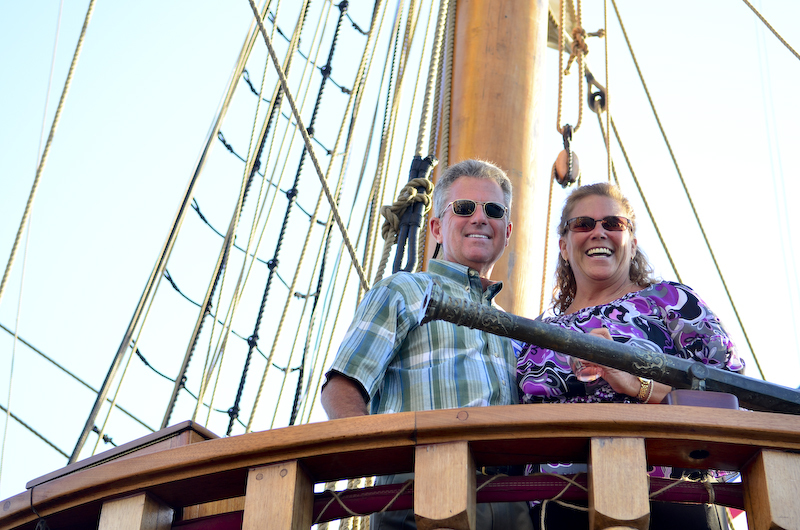 Boasting about 8 miles of rigging, three enormous masts and nearly 7,000 sq.ft. 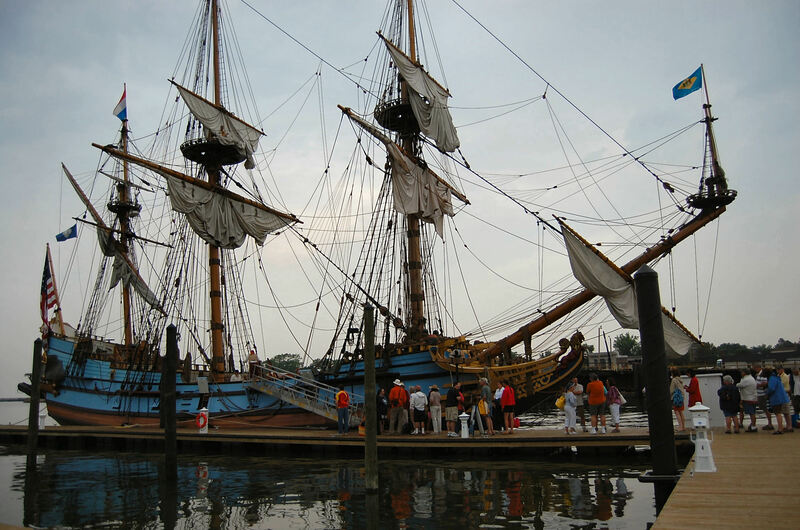 of sail, the Kalmar Nyckel is a most impressive ambassador of goodwill for the state of Delaware. 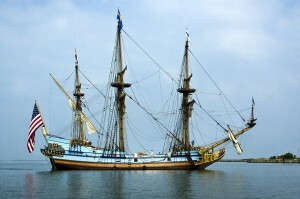 It is near what is now Wilmington that her namesake first landed, on behalf of the Swedish Crown naming the area “New Sweden”, the first of four round trips she would make from Sweden to “New Sweden” before she was refitted as a warship in 1638. It didn’t take long to get underway. Her big diesel engines fired up, ( no, they didn’t have engines in the 1600’s but hey, some things are too important to do without, even in a faithful reproduction), many orders issued from the bridge to the crew, mooring lines were cast off and away we went for our 2 1/2 hour adventure. As we left the Cape Charles harbor, 5 or 6 yachts leaving the Bay Creek Marina waved as they passed, surprised I’m sure to see this ornate beauty in their home waters. As the ship got further out into the Bay the winds started picking up and the crew made ready to hoist the sails, enlisting the help of passenger volunteers to do so. 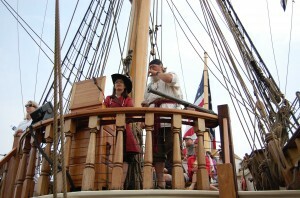 First came the instructions, terms like “avast”, “ease” and “haul” were demonstrated and practiced. 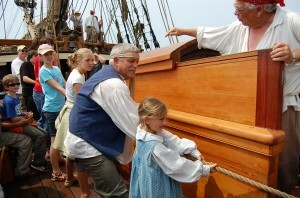 Then it was time to hoist the topsails, the main top and the fore top, and this was done just as in the days of yore, pulling to the rhythm of an old sea chantey, in this case a tune called “Bully On The Deck” which has a rather captivating beat. ( I found out later that the term “bully” in sailor parlance means inebriated. ) 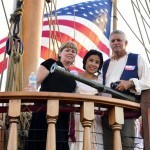 The winds were with us and the sails filled nicely, speeding us along. It was the wind, blowing pretty well by then, which initiated an inpromptu little training drill much to the surprise of both the crew andpassengers. I was on the upper deck, standing just behind the Captain, taking some photos when a gust swept a wide-brimmed straw hat right off a crew member’s head and sailed it smack into the water. When the Captain saw that she decided right then and there to conduct an unscheduled “man overboard” drill. In a matter of seconds alarms sounded, crew moved into various positions, on the upper deck “spotters'” grabbed binoculars and trained them on the hat, job one being to keep the “man” in sight at all times, especially difficult to do as the ship begins its turn back towards the overboard area. On the lower deck, crew threw out life preservers which in the event of a real problem are an effort to send a number of flotation devices out towards the victim in hopes that one will be grabbed. 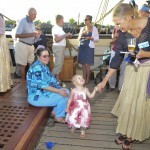 All passengers on the lower deck were asked to move towards the bow. 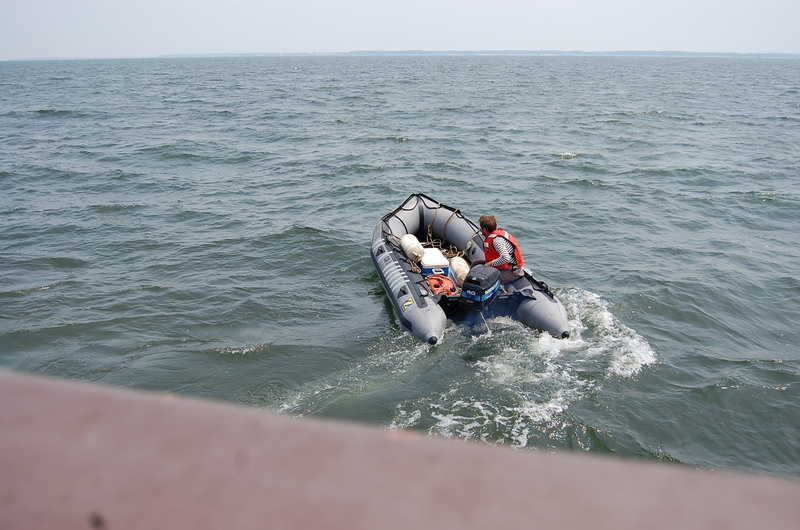 The rubber Zodiak , which is secured to the stern, was lowered into the water, engine started and the 2nd mate and another crew member set out for the rescue. Meantime, designated crew members were busy counting passengers, counting crew and talleying numbers to make sure everyone was accounted for, that only one “man” had gone overboard. All of this was done quickly and efficiently, the Captain issuing rapid orders, crew quickly carrying them out. Unfortunately, the hat drowned. But the drill came off very well, the Captain being quite pleased with the opportunity to carry off a surprise drill and the passengers excited to participate and see how well it all worked. The Zodiak was resecured at the stern and the journey continued on. 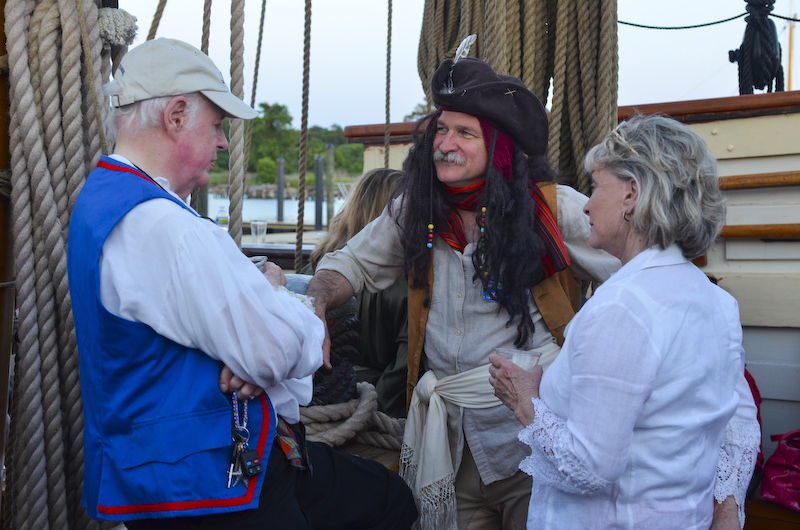 On the homeward leg I had the opportunity to talk a bit to Ellen Carter who is in her fourth season of volunteering on the Kalmar Nyckel. 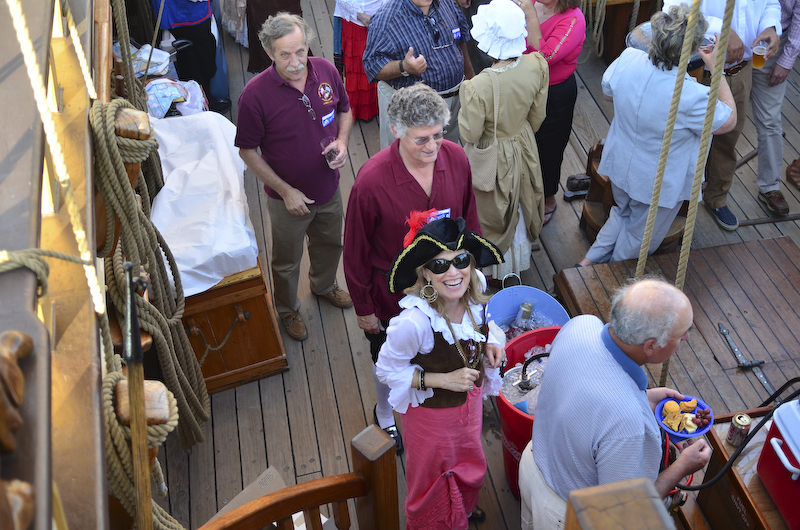 She was at the helm, steering a course back to the Cape Charles harbor, keeping one eye on the whipstaff, another on the modern electronic depthfinder and course charter, ears perked for the Captain to issue orders but still able to tell me a bit about the ship and life on-board. 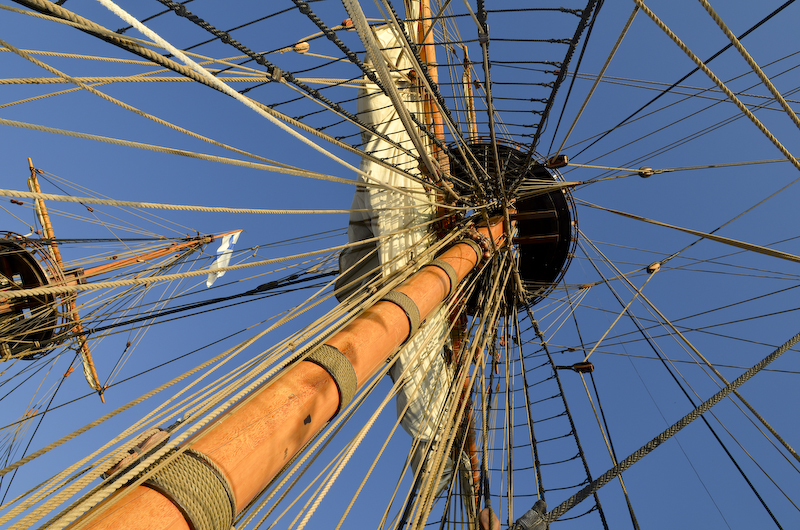 The helm on the Kalmar Nyckelis not the big round wheel that one traditionally thinks of– rather, it is a 6-7 ft. long pole, about 4-5 inches in diameter, called a “whipstaff”. 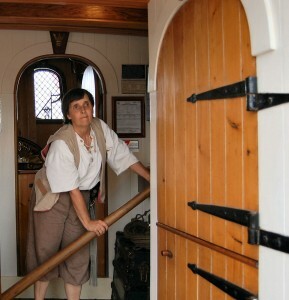 Connecting through a yoke into the tiller, which in turn moves the ship’s rudder, it’s called a whipstaff because a sudden, unexpected movement of the rudder will cause it to whip to one side or the other with great momentum– definitely don’t want to daydream on helms watch ! Ellen told me that the rudder weighes about 3200 pounds but that even though a lot of force may be needed to push the whipstaff in one direction or another, because of its length, the helmsperson has about 40 to 1 mechanical leverage. Otherwise it would take Godzilla to steer the ship ! And to think that they had all of that all figured out in the early 1600’s ! 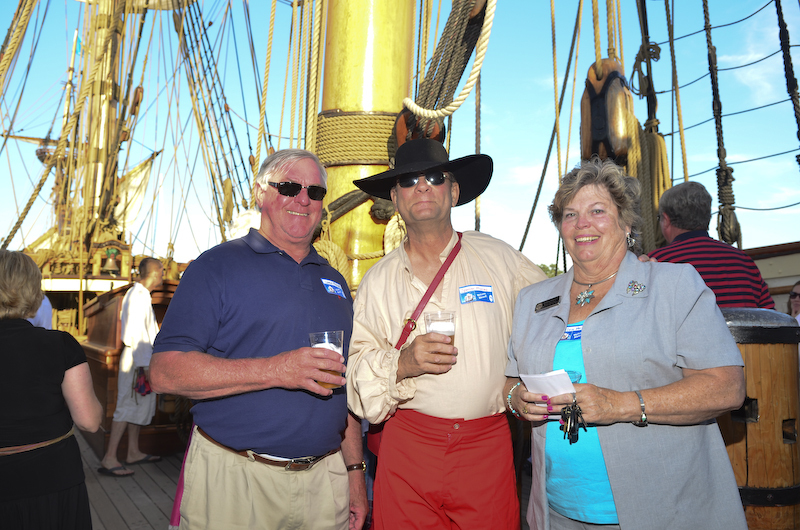 I was interested in the day-to-day aspects of life on board. 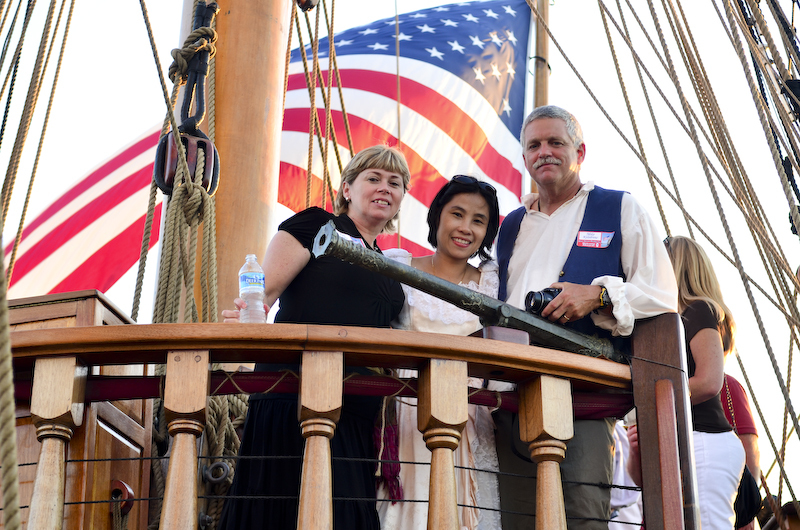 Ellen indicated that topside Kalmar Nyckel is a faithful reproduction of her namesake but that below decks the crew has pretty comfortable modern quarters. 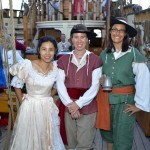 The Captain, 1st and 2nd Mates and Steward are paid crew, on board for about 8 months of the year and have their own quarters. 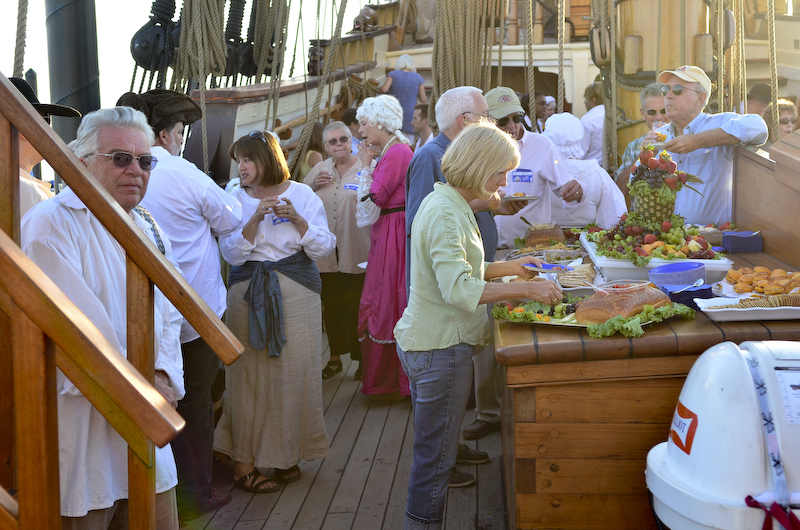 10 bunks off the galley and 10 more off the saloon provide spaces for the rest of the approximately 12-20 person crew ( depending on the venue) which is all- volunteer. 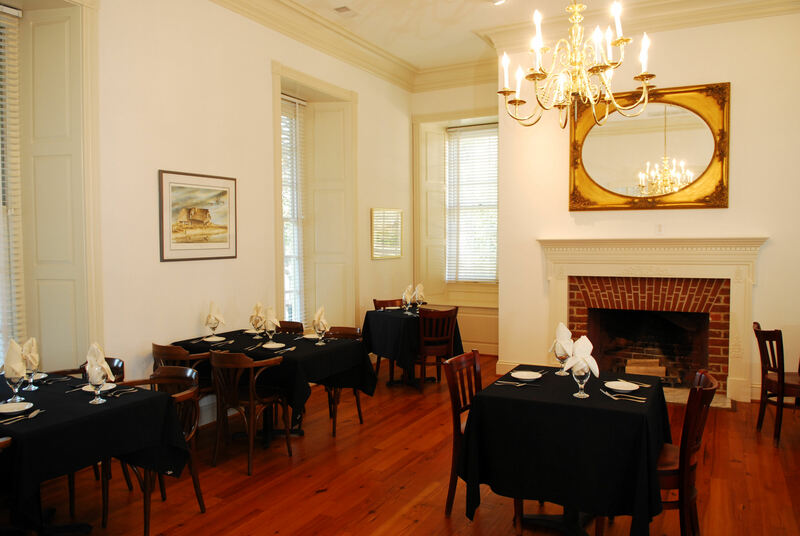 According to Ellen the food is very good and the cook tries to cater to special diets-i.e., vegan, Kosher, etc., plus there is plenty of good strong coffee and even bundt cake for dessert sometimes. 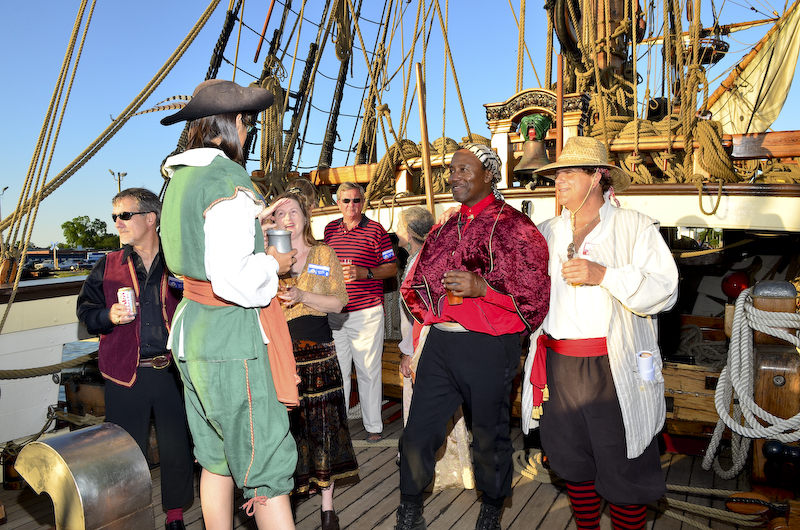 The days of hard tack with a dram of rum are apparently long gone ! Too, too soon we were dousing the sails and heading into the channel, the journey was about over but the memories will linger on. Even the weather co-operated beautifully- early in the week it had been quite warm, high temps about 90 but thankfully the wee hours of Friday morning brought a cold front and the day dawned in the low 60’s with refreshing breezes all day long. I was so relieved because in my role as Chief Cook & Bottle Washer for Blue Heron’s on-board reception from 6:30 to 8:30 that evening , my biggest worry all along had been how to keep cold hors d’oeuvres cold on a warm evening, on deck , with no real refrigeration and precious little shade. We were, of course, already prepared with lots of big coolers and special serving trays with ice reservoirs underneath but still, I was really delighted that the high would be only in the mid-70’s ! 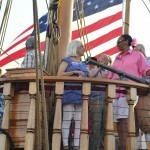 The evening kicked off about 6pm with an official Welcoming Ceremony which included the Northampton County High School Band, presentation of the colors by the Coast Guard, remarks by Cape Charles Mayor Dora Sullivan and presentation of a huge gift basket for Captain Lauren Morgan and her crew. 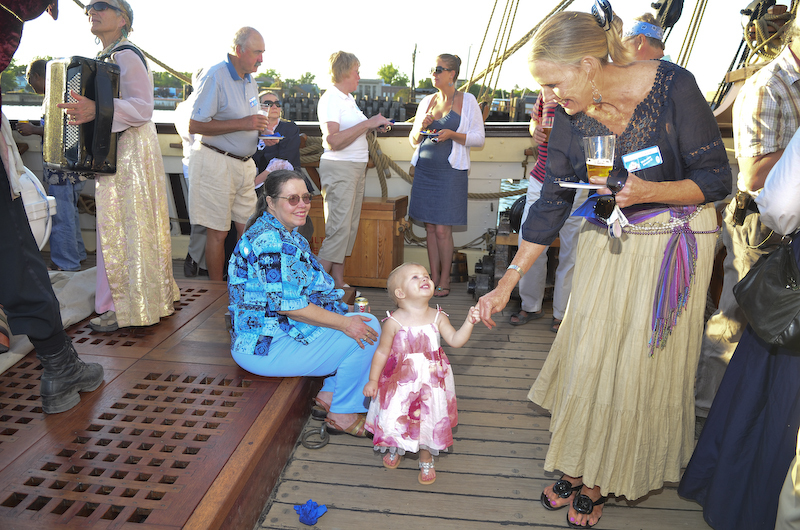 Then it was on-board for Blue Heron’s reception which proved to be a merry time indeed. 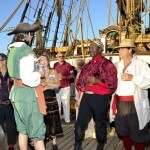 The invitations had gone out with Colonial or pirate attire as an optional dress code, just to spice things up a bit. Period attire was another of Dave’s ideas ( well, truth be told, Dave had hoped for mandatory but settled for optional ) and it added a lot of entertainment to the evening. 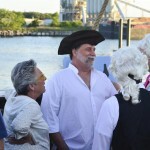 The Kalmar Nyckel crew also wore their Colonial garb adding to the over-all ambience but I must say that the top prize for guys for the evening ( had there been one ) would have gone to local Eastville attorney Bert Turner, usually seen in a sharp suit and crisp dress shirt, whose flowing wig, rakish hat and fancy garb transformed him so completely into a fashionable Colonial pirate it seemed as if he had truly just stepped out of a time machine. 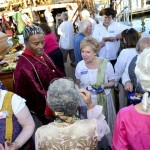 A number of the the ladies had really wonderful costumes as well, including Irene Henderson, Sandy Mayer, Susan Kovacs, Dianne Appell, Ann Walker and Carol Russ. 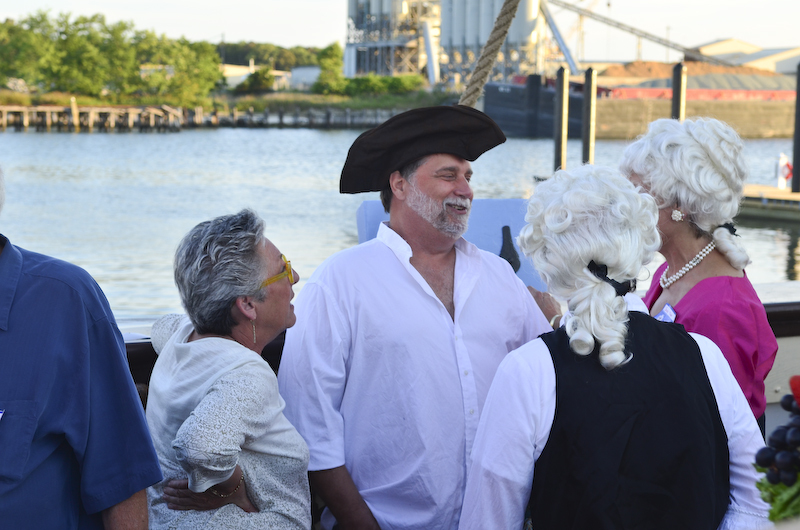 Even Cape Charles Town Council members Bruce Evans and Joan Natali as well as County Supervisor Spenser Murray got into the Colonial garb spirit, wearing period vests, blouses and breeches. And if I do say so myself, the food turned out quite well too. Planned and executed by Blue Heron’s “Reception Committee” headed up by Gerry Forbes and rounded out by Lisa Anderson and Kay Lewis, these ladies planned and put together an attractive and tasty array of cold appetizers including a beautiful centerpiece fruit tray of 3 different types of melons, 3 different types of grapes, some lusciously ripe Hawaiian pineapple and picture-perfect strawberries, then garnished with kiwi, cherries and blackberries. Flanking the fruit tray on either side were trays of assorted cheeses plus bread bowls filled with a most tasty humus as well as chopped spiced tomatoes for bruchetta complimented by a large relish tray of mixed olives with marinated mushrooms and artichoke hearts. But the most popular item seemed to be the mini sweet potato biscuits stuffed with country ham, the contrast of the sweetness of the biscuits and the saltiness of the ham was absolutely perfect and a great accompaniment to the fruit and cheeses. Early on in the planning stages we did an office wine tasting lunch to decide on the wines, ( yup, everyone somehow managed to just “happen” to be at the office at lunchtime that day ! ) A unanimous vote chose a fruity rose’ sparking wine as the favorite, with a dry white sparking wine a close second. These were served along with Samuel Adams light summer ale on draft which proved quite popular as well. Entertainment was provided by the very, very talented duo of Carol Russ on accordian and Malcolm Russ on violin, whose wide ranging repertoire included many popular songs like Red Sails In The Sunset to about 15 robust choruses of What Shall We Do With A Drunken Sailor vocalized by Dave Kabler together with the Kalmar Nyckel’s Captains Lauren Morgan and Sharon Litcofsky. I personally think that the right music can help make or break an evening and the Russ’ performance was great, it added so much to the over-all ambience. 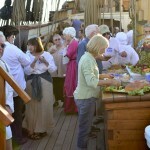 A pleasant summer’s eve, a light breeze blowing, laughter here and there, pleasant conversation all around, good food and wine, all on-board such a unique venue, a beautiful tall sailing ship. 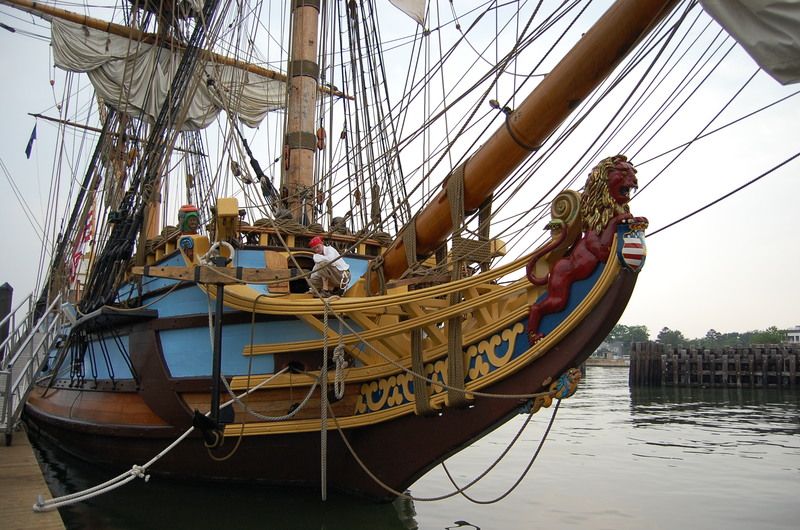 But because the Kalmar Nyckel has no real lights on deck, by previous agreement, the Captain needed guests to depart before 9pm, so too soon it was over. Malcolm and Carol played that very beautiful song made famous by Sarah Brightman some years back, Time To Say Goodbye and with that we all said our good night’s and goodbye’s but those of us at Blue Heron won’t soon forget this special evening. Arguably the finest house in the historic Chesapeake Bayfront town of Cape Charles, Virginia , the Kellogg House at 644 Monroe Avenue, remains for my children their cherished residence, full of childhood memories. 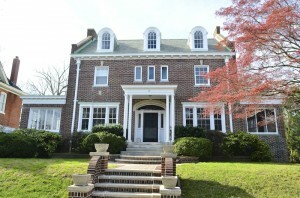 From elementary school-aged children to high schoolers, this house was the center of their universe for eleven years. 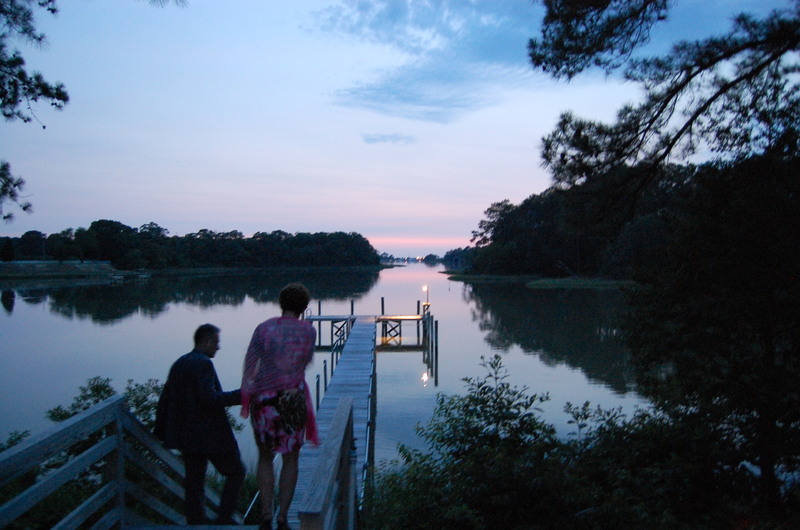 Having spent over 4,000 nights there, I have a unique appreciation for its particular special history, qualities and features completely aside from the special amenities in Cape Charles such as the great town beach, Palmer and Nicklaus world class golf courses and a new state-of-the-art marina. And believe me, there hardly was a morning that I did not awaken with the feeling of how privileged I was to live in such a fine old home! on the sidewalk out front gazing up at her parapets, this grand lady calls, welcoming one to climb the granite steps to the front portico supported by pairs of twin Doric columns. 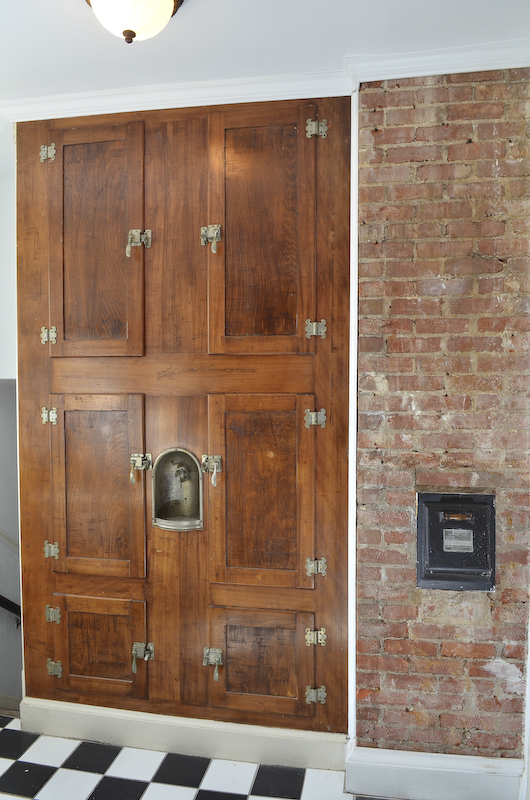 A great big door with lionshead knocker guards the entrance that is lined with leaded glass-paned sidelights and fan light above. Dropping the bar on the knocker sends a resounding clap echoing down the entrance hall and up the grand staircase. My memory recalls the kids bounding down the stairs to answer the door, ready for friends and play. 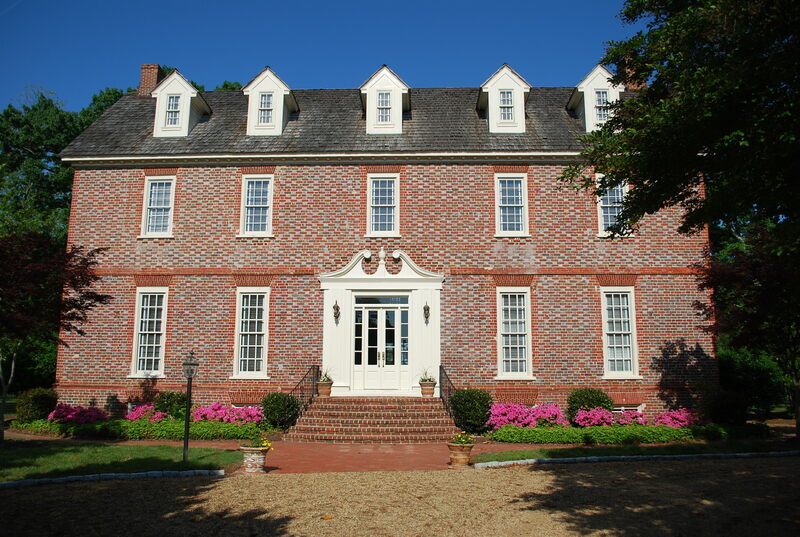 Mr. Eucebius Milton Kellogg completed the construction of this magnificent house in 1928, two years after sinking the massive foundation that supports the impressive brick and steel structure of the home. I understand that 6 months was spent on this foundation, driving contiguous pilings deep into the footprint upon which the concrete footers were poured. As the basement is at ground level, mounds of earth were piled high up against the front walls, giving the impression from the street the home is built on a hill. 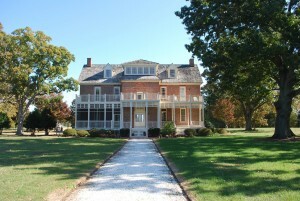 Mr. Kellogg was a railroad tycoon and wanted his final home to last for centuries! Walls three and four bricks thick stand upon the poured footers and threaded throughout each of the three floors of the home are 12″ steel I-beams. No big, bad wolf is going to blow this house away! Great, big, formal spaces lend an air of elegance and are finished with architectural moldings, up to five pieces hand-fitted together. 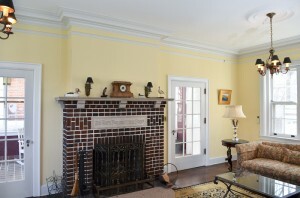 In the center of the outer wall of the living room is a grand masonry fireplace with stone mantel and carved insert in French script. On either side of the massive fireplace, a fireplace that warmed my cold feet on many winter nights, are big French doors offering easy access to the Spanish tiled Florida room. 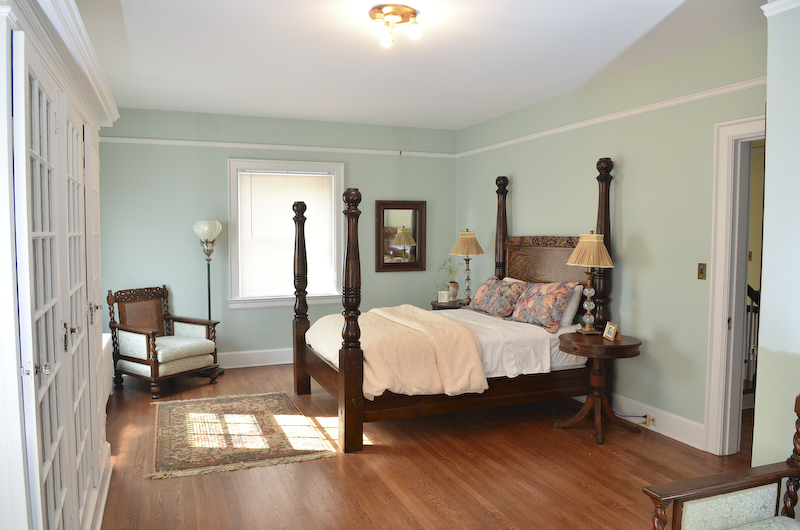 magnificently refinished to attract the attention it deserves. Two sets of back stairs lead down to the basement and out into the back yard. The great kitchen also has the same type of stacking windows as the Florida room and allows for wonderful ventilation while preparing and cooking food. Between the kitchen and the dining room and just off the butler pantry is another little surprise, a charming, tiled breakfast room surrounded by six paned, double hung windows that bring the soft morning light and outdoors inside. And off the dining room is a cute, little tiled screened porch, one where I often slept on an army cot during hot summer nights. are, appointed with a beautiful mahogany bannister with curled end at the bottom. At each of the three floors is an access door that opens to the laundry chute for conveniently making soiled, and in the case of lazy children, not so soiled clothes disappear down to the laundry room in the basement. as the tops of the huge crepe myrtles in the back yard – a perfect place for sunbathing! The third floor was clearly designated for two servants to live in, with two identical bedrooms and a full bath with huge tub between the two. 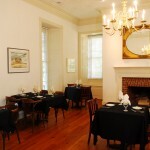 All three of these rooms are served with identical dormers with curved-topped French windows that peak out over the street scene far below. 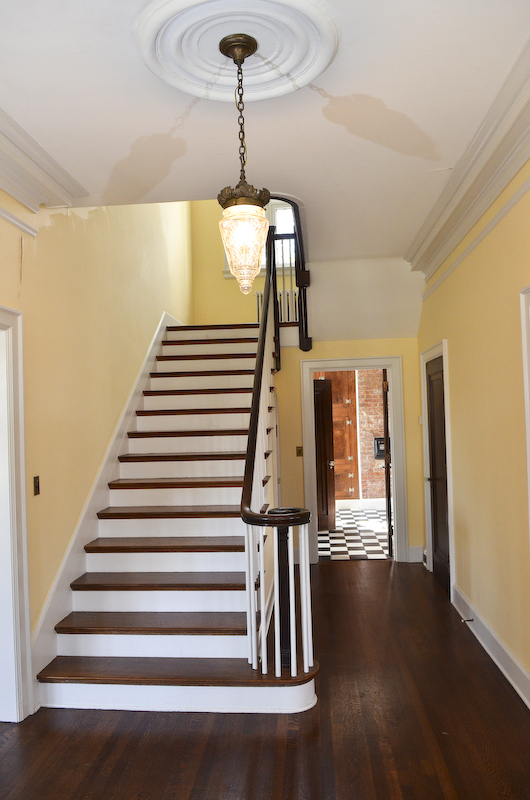 The curved plaster-on-lathe ceilings are so gracefully formed, yet the floors here are only common heart-pine while the two more formal floors below have beautiful oak hardwood. I could continue on and on with more details about this unique and beautiful home but I shall save the rest for a future post. 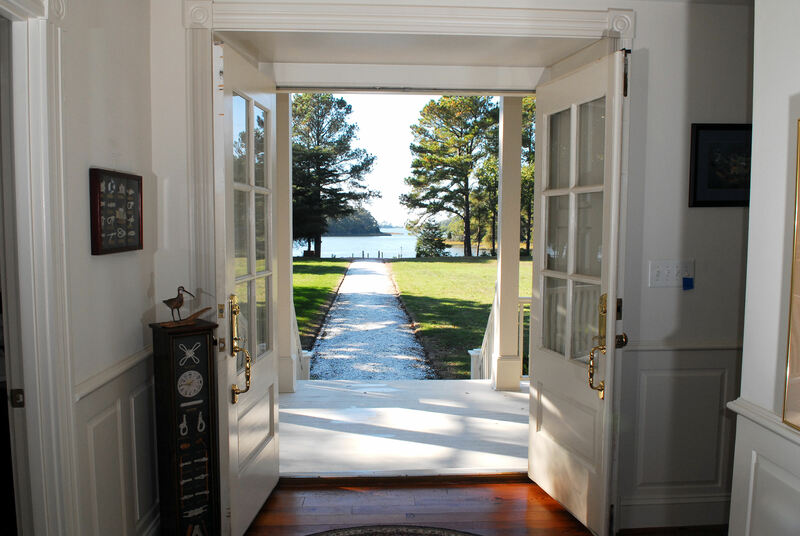 However, should you be interested in making an appointment to see this splendid and lovingly constructed historic Cape Charles home, please give Blue Heron a call at 757-331-4885 or email me at davidk@esva.net. You are currently browsing the Life and Real Estate on the Eastern Shore of Virginia blog archives for June, 2011.